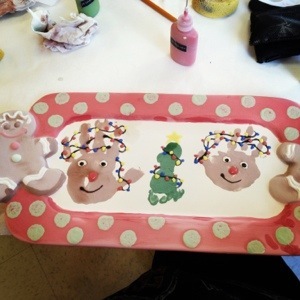 This weekend I took my boys to a ceramics studio and we made this adorable cookie platter using the two older boys hands as reindeer and the babies foot as a Christmas tree. I can’t wait to see it after its been fired. If its even half as cute as it is now it will be a family heirloom for years to come. To manage my brood I had some help from my husband who rushed the two little ones in and out. My oldest stayed with me while I put the details on and made a few Christmas gifts he can give to his grandparents and other friends and family members.